There was a 3.5 quake at the Chalk River nuclear reactor site on the Ottawa River about 150 miles north from the Nation's Capital on 29 March. There have also been reported quakes in the middle of Lake Ontario. We see this is a fault line reported on Zeta Talk. If this fault line collapses under the lake, or disrupts Niagara Falls, does this mean Toronto and other cities along the lake - both in the U.S. and Canada - suffer severe flooding? Many now are concerned about the safety of that nuclear facility so close to the Capital. Do the Zetas have anything specific to say about this part of the land at this time? This is a part called "Ottawa Valley", formed by a massive geological event thousands of years ago. Is this considered a very unstable area during a pole shift? Much of east Ottawa is build on type of clay which turns to a jell when suffering a shock and causes masses of land to slide. I have recently moved to the west end of the city on a more solid rock base, but do not relish living on the 14th floor of a high rise. It is difficult to choose a safer place given the evidence now presenting itself. This area has already experienced a 5.3 last June , and was felt all the way to Toronto and into the U.S., but did no damage to my building. Any advice from the Zetas would be most welcome. 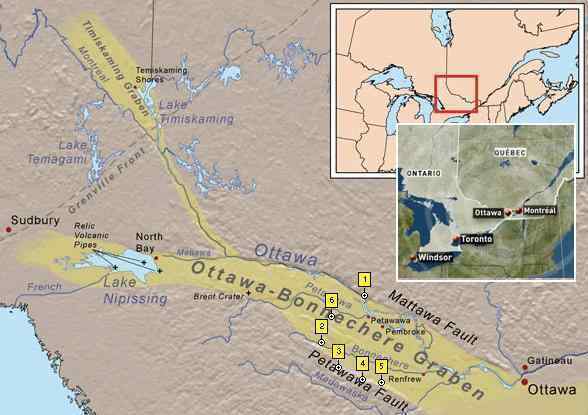 [and from another] http://www.mcelroy.ca/notes/graben.shtml The Ottawa Valley is a rift valley, a dropped down block of bedrock several tens of kilometers wide, known as the Ottawa Bonnechere graben. [and from another] http://www.thestar.com/news/gta/article/827761--earthquakes-in-ontario-rare-but-not-unexpected About 150 million years ago, North America started to split in two along what is now the Ottawa Valley, with the northeast side and southwest side moving away from one another, said Pierre Robin, professor emeritus in the University of Toronto's geology department. We have stated that the Ottawa River will split open during the pole shift, separating the part of Ottawa on either side of the river in the process. This split is, of course, along the existing fault line that runs under the river, where the rock is already pulling apart. This will not occur until the pole shift, will not rip during the New Madrid adjustment expected during the 7 of 10 scenarios. We have described the trauma that cities along the Seaway will experience, during the new Madrid adjustment and beyond, as devastating as regards earthquake shaking but not as regards inundation. Cities to the south of the Seaway such as Cleveland, Toledo, and Buffalo will be shattered during the 7 of 10 New Madrid adjustment, but the pinch in the Seaway where the Seaway opens into Lake Ontario will not split during the 7 of 10. 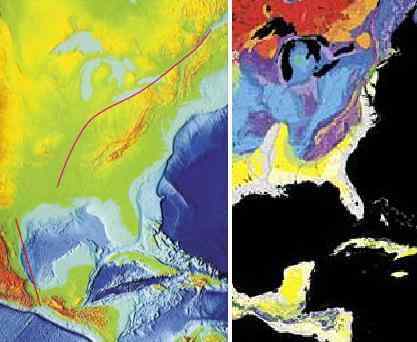 And even though the Seaway will split open at the pinch during the pole shift, Montreal just north of this pinch will survive, although shattered by earthquakes. Niagara Falls will likewise not split open until the pole shift itself. As to questions on what spot on Earth might be "safe" from devastation, it would be amusing if it were not so tragic to hear questions on whether the 14th story of a building would be safer than the clay soil nearby where landslips might occur. neither are safe during a pole shift. All parts of the globe will suffer magnitude 9 quakes, all cities will be reduced to rubble, and high rise buildings will be death traps! All nuclear power stations will be in distress and in danger of a meltdown. How many times do we need to say these things for the reality of what is coming to sink in? Your comfortable life as a city dweller cannot continue. Why doesn't the US/Collitation forces just bomb Gaddafi? If you cut the head off the snake the rest of it dies. Why don't they just bomb the "mad dog" and end the violence? Are they trying to locate Gaddafi? Is he really keeping kids and women near him as human shields? Cooperation between nations is not based on the big fist, as in the cave man days when he who was the brute and could bash the heads of his opponents became the leader. Cave man politics involved not only protecting the troop from being raided by other clans, but also protecting the troop from large predators. The brute was the leader because he personally was the prime line of defense and because he could eliminate any competitor. He was first to the meal table, the equivalent of the head of the table in today's families and politics, and had his pick of the women. Much of what goes on in the world of man is still similar to this scenario. The tall, large man is often the leader, the rich man has his pick of women, and the country with the most weapons and the largest military wins during the trade wars. Enter modern politics. Democracy allows every citizen his vote, and civil rights count. At least this is the theory, though practice seldom follows. Enter the United Nations. The brute must take a chair, and use the power of his vote instead of his club. Gadafi, of course, comes from the old school where the brute can create a blood bath, eliminating not only his competitors but also anyone who even entertained the thought. Such is his intent, and such has been his practice for several decades. What should be recognized is that cooperation between nations, and practicing anything but man's tradition of allowing the brute to have his way, is a delicate and tenuous matter. The brute's fist is clenched just under the velvet glove worn by those in politics. The United Nations gains cooperation and agreement by promising not to attack the brutes that are voting on the issue! Each country voting is being a brute, in some form or another, within their own countries. If a brute is simply to be squashed, rather than induced to stop his practices, then each country voting fears they too will receive this type of treatment. Thus there are rules in place, such as no assassination of a country's leader, to allow these discussions and votes to continue. In the current dispute over the no-fly zone over Libya, Turkey as a NATO member was reluctant because they forsaw their own troops being bombed in defense of citizen rights. Turkey has restless elements within its society, the Kurds, for instance, who might seek to rebel as is being done in Libya. To understand international politics, look to the brute just under the surface, and you will see why certain steps are taken. Many are feeling dizzy right now and it seems there is no end in sight to the nausea. After the Grammy's a CBS TV reporter had some kind of strange migraine and couldn't keep thoughts and words straight. These videos below have gone viral over the net. Are these folks in these videos feeling the affects of the bursts of particle matter emanating from the Earth, or magnetic disturbances from the tail of PX? Is this common for what to expect sometimes as the 7 and PS gets closer? Magnetic surge can cause various symptoms in humans, such as dizziness, nausea, and in the case of woman, more frequent and heavy bleeding. Magnetic surge does not cause the brain to malfunction, though a transient stroke or a seizure can cause temporary jumbled speech. 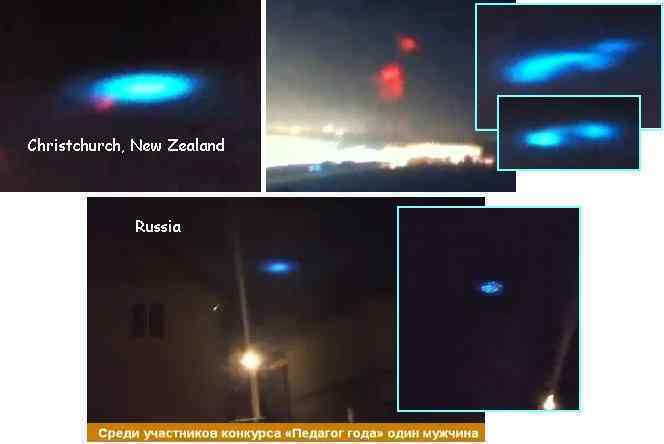 There is a huge amount of Blue and Red Orbs/Spirals being captured in the sky globally, may we ask what they are and their purpose? New Zealand/Christchurch: by ProfanityDubstepNZ on March 29, 2011 http://www.youtube.com/watch?v=G-YVByaKw2k Russia/ Hanti Mansijsk: by AlienDisclosureGroup on Apr 5, 2011 http://www.youtube.com/watch?v=srVsPtZUolI [and from another] http://www.disclose.tv/forum/new-blue-spiral-seen-above-russia-t48498.html A new spiral over Hanti Mansijsk. A witness to the puzzling occurrence was a resident of Hanti Mansijsk. At night he saw in the sky, above the city, a bright light. He made a few photos with his mobile phone. In his words, a blue long shaped object , at first, was stationary in the sky, later it disappeared and was silent. As reported by the Airport tower there were no flights coming in or out between 3-4AM and the radars did not pick up any unidentified objects. In the photos you can make out the bluish silhouette of some sort of a UFO. These are not UFOs! These are electromagnetic swirls, only captured on film because they occurred over populated areas. These swirls made their most dramatic appearance over Norway on December 8, 2009. What is the significance of the increase in these swirls? Caused by the charged tail of Planet X, which increasingly is wafting toward Earth, this indicates a change in the position of Planet X vs a vs the Earth. The Earth can begin to expect a more violent wobble, an uptick in the 7 of 10 plate movements, as well as an increase in such signs in the skies. There will be more than glowing blue and red swirls in the skies soon, but of this we can say no more at this time. NASA's Messenger Spacecraft is currently orbiting Mercury and taking pictures. At the same time, Planet X is getting closer to the sun while Mercury is the closest planet to the sun within our solar system. This cannot be a co-incident and the true mission of this messenger spacecraft seems to be studying the approaching Planet X. Would Zetas care to comment on this? If zetas knew the true mission of this spacecraft, why would zetas allow NASA to succeed in monitoring Planet X? How is NASA doing, in their attempts to triangulate the position of Planet X - its speed, its path, the alignment of its magnetic poles? Poorly, but not for lack of trying. They have been sending probes aloft, and out into the vicinity of Planet X, since its discovery in 1983 by the IRAS team. The Pioneer probes, as is known, were sent forth specifically to peek at Planet X and to determine its speed and trajectory. Since Planet X entered the inner solar system in 2003, all probes sent aloft in addition to the ISS and Hubble have been employed in peeking at Planet X. This does NASA little good, as the answers they seek are outside of human knowledge. The magnetic and gravity dances we have described, between Planet X and the three small planets trapped in the cup, are a mystery to man, who relies instead on his pathetic math formulas. These formulas have been repeatedly shown by us to be inept attempts to describe the Universe around man. For instance, the issue of why the Moon stays aloft, when it is too large, and moving too slowly for centrifugal force to keep it aloft. Man cannot put his formulas together on the same page! Thus at one moment he finds Planet X in what he assumes is the path, and at another it has turned away, twisted somewhat to the side, and has developed a twirl. None of this makes sense to man, who is unaware of the thousands of variables at play. NASA is still keeping the truth from man, and will get no assistance from ourselves in their struggles to protect the elite during the coming times, while they doing harm to the taxpayers whose funds they rely upon. http://www.youtube.com/watch?v=RRCmlpNWjMY March 18. Palm Coast (the coast of Florida - annotated. interpreter), Florida. - Researchers are trying to solve a strange mystery surrounding Flagler. A flurry of calls has fallen by 911 around 9:30 am on Friday with reports of tremors in the area of land Flegler. All calls received from people living in the territory of the Hammock to Palm Coast. The U.S. Geological Survey said the county Flagler that the sensors in Georgia and Orlando have not detected movement. In turn, the National Weather Service reported the lack of something unusual, Navy and Coast Guard told WFTV, that they had no information about any military exercises with the use of bombs. http://www.wftv.com/news/27239681/detail.html I thought that this could be due to a shift of the poles. Whether it was the usual earthquake or all the same reason for this phenomenon is another. Seismic activity in Florida is almost nil, as it has virtually no fault lines. The rock strata is young, and loosely connected to older rock inland. An analysis of the rock strata shows that the trembling in Flagler County is at the border where younger and older rock meet, and the point where quakes in the Florida region pick up. When the N American continent is pulled into a bow, loosely connected rock strata disconnect, often in a gentle manner! This is not perceived as an earthquake, as it is akin to stretch zone movement of the Earth - essentially silent. We have frequently mentioned that Chicago will suffer during the coming New Madrid adjustment and again during the coming pole shift. The rock under Chicago will lose support, pulling apart and dropping during the New Madrid adjustment, creating the implosions we have predicted for some cities when the infrastructure drops. Chicago did not suffer during the last great quake on the New Madrid fault line in 1811, and thus the residents may be smug about the coming adjustment. The telepathic warning given during the UFO display relayed the reality of what is coming. Some will listen, but many more will choose to continue with their comfortable life and ignore the warnings. During the 7.4 Earthquake that struck Japan recently, there were some "blue flashes" caught on Video. Maybe the Zetas can comment on this phenomenon? What is it? Earthquake flashes, UFOs, broken electricity lines? [and from another] Earthquake light http://en.wikipedia.org/wiki/Earthquake_light An earthquake light is an unusual luminous aerial phenomenon that reportedly appears in the sky at or near areas of tectonic stress, seismic activity, or volcanic eruptions. Once commonly challenged, it was not until photographs were taken during the Matsushiro earthquake swarm in Nagano, Japan, from 1965 through 1967, that the seismology community acknowledged their occurrence. They are reported to have shapes similar to those of the auroras, with a white to bluish hue, but occasionally they have been reported having a wider color spectrum. Earthquake lights are nothing new, the blue glow on the horizon seen most often just ahead of the jolt. These lights are not observed by those at close proximity to the epicenter, but at a distance due to the diffuse nature of the light. We have mentioned that rock under stress compresses, allowing electricity to course through the rock via water in the rock that fills all the cracks and crevasses formerly filled with air. Such explosions of electrons do not travel alone, as is known in electromagnetic surges. Electrons on the move encourage a lot of traffic. Lightning is visible not because of the electrons on the move, but because of photons that accompany the surge. Could you please ask the Zetas about the new map of the poles with the equator on about 10 degrees west and the new pole on 29 degrees west this would create a needed widening of the Atlantic by 70 degrees which is 70 x 60 nautical miles = 4200 miles. Is the pacific going to compress by a similar amount and where and how will this vast amount of water travel? Nancy has arranged the continents on a globe, in accordance with our projected New Geography. The new poles are at the Lat/Long we gave some months ago. The Equator runs through the old poles, down past the Americas, and up along Africa and Europe. Note that the size of the new Atlantic equates to the size of the new Pacific. 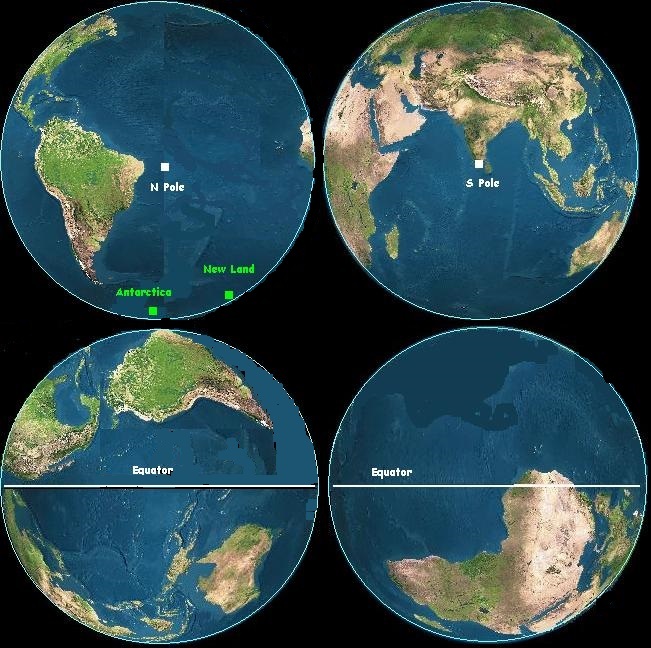 Land is more evenly distributed from any view, unlike the current view of the northern hemisphere which is dominated by land, and the current view of the Pacific which is dominated by water. The exact position of the continents is not in complete accordance with their post poleshift alignment, however, but to detail these changes would be getting into the 8 of 10 scenarios prior to the time when we are ready to discuss these scenarios. Could Zetas comment about the present status of Indonesia and its further development after 15 weeks. Being at the 15 week point on April 9, 2011, are we done sinking yet on the plate tongue holding Indonesia? This has not yet completed, though is at the point we anticipated for some regions on Java and Sumatra. The sudden sinking on the neck of the Thailand peninsula, the intractable flooding in Medan in Sumatra, and the clearly permanent flooding in the Lamongan/Rengel region of Java show the pace and result we anticipated. But additional sinking will occur, as these regions are still settling. That the ground is cracking and heaving has also been obvious from news reports, a result of the compression of the essential rubble that composes these large islands along the Indonesian curve. Some regions will sink further, and others, which have heaved, may settle, resulting in a lower elevation. The primary issue, among those looking for closure on our prediction regarding the sinking of the plate tongue holding Indonesia, is the cities of Jakarta and Singapore. Where they have lost elevation, it is nowhere near the elevation loss we predicted. Both cities have established sea walls, particularly around their airports, but the sinking clearly has not reached the levels we predicted, particularly for Singapore. We predicted that the pace of sinking would accelerate as the process progressed, and this is still a nightmare pending for the region. The tongue is under pressure pushing it down under the curve as well as crumpling it in an accordion manner from the side. When it slides under the curve, it fans out, relieving the accordion structure the land masses have assumed to accommodate the pressure. It flattens, those parts that have heaved dropping, and it is at this point that those cities anticipated to flood will catch up with other regions. It is the very pressure in the moments prior to the final push of the tongue under the curve that is deceptive, as this allows heaving, the accordion structure to be most extreme. Where there have been delays in the final outcome, geological processes involve thousands of factors, so precision is not always possible. Nevertheless, the result in all our 7 of 10 predictions will come about, in their time and in the sequence we have described.